My lecture’s odd name derives from the great similarity between Israeli government policy on learning and social gaps – “two steps forward, one to the side, one step back” (or something along those lines) and the tango, in which dancers sway together, generally have fun, sometimes step on each other’s toes, but barely move from the spot at which they started. Recognition that the problem exists. Well-established and reliable information (preferably based on scholarly research and proven experience) indicating that the problem can be addressed. Access to the tools needed to address the problem. The desire, determination and political power required to mobilize all those capable of supporting the proposed solution, and to neutralize those liable to oppose it. The fact that learning and social gaps in the education system are being recognized is nothing new. This kind of recognition has existed since the mid- or late 1950s, when the idea that the Israeli education system could answer the needs of all of its pupils without acknowledging the unique needs of specific pupil subgroups was revealed to be a delusion. This painful understanding coalesced around the results of the survey tests that the Ministry began to administer to eight graders in 1955, and has been reinforced by the outcomes of Israel’s matriculation exams and by Israeli pupils’ performance on international tests, all of which consistently demonstrate that gaps persist. The way in which we define scholastically disadvantaged groups has changed over time. At first the problem was thought to be mainly a new-immigrant issue; later it was associated with Mizrahi immigrants (of Middle Eastern and North African origin); then it was pupils from Israel’s development towns and poor neighborhoods; only somewhere between the late 1980s and the early 2000s did the problem begin to be associated with Arabs and Haredim (ultra-Orthodox Jews) as well. 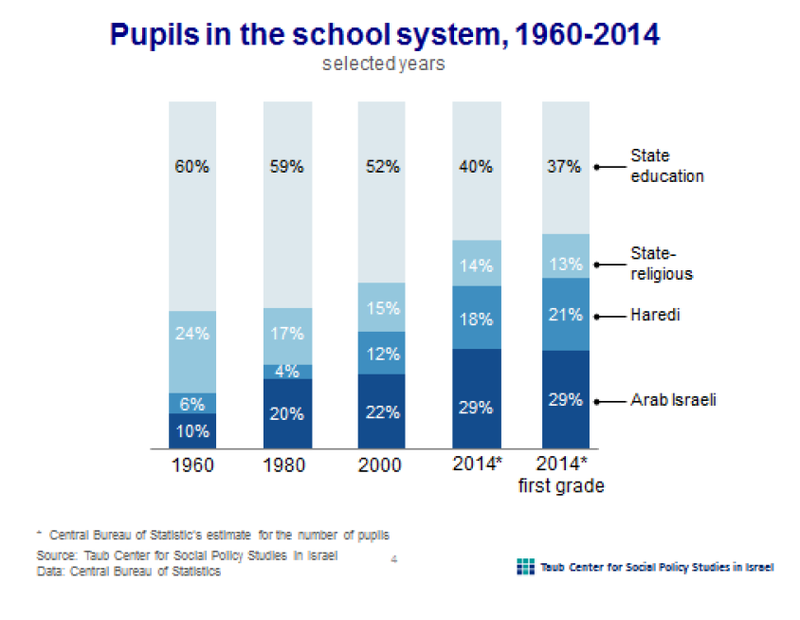 These changes in definition were not coincidental or unimportant; they reflected Israeli social, demographic and political developments and, by extension, changes in the education system, which underwent a dramatic shift: from the situation in 1960, when Arab and Haredi pupils constituted just 15% of the pupil population, to the situation today, when they account for 46% of all Israeli pupils. 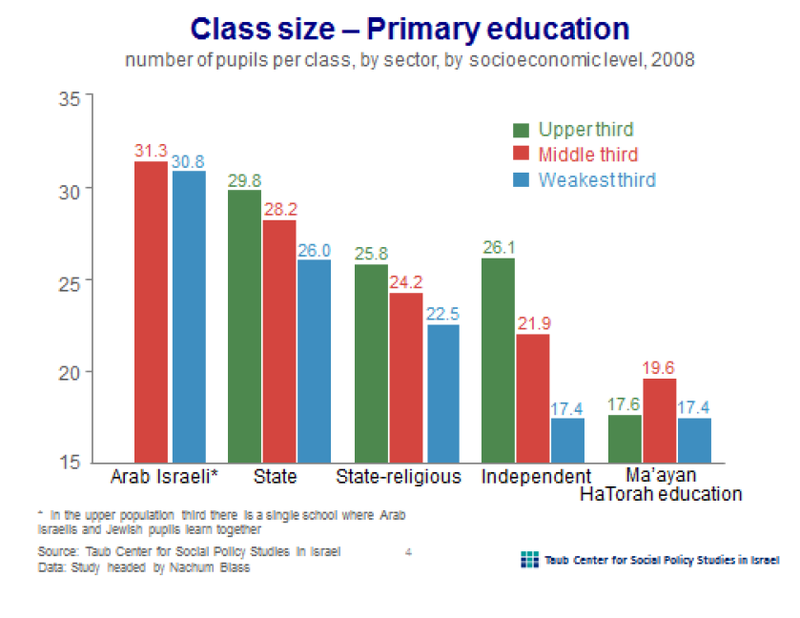 This social and demographic reality was also decisive in shaping the Israeli educational leadership’s attitude toward the learning gaps, their importance, and the means of addressing them; they also affected the leadership’s willingness to invest budgetary resources and political effort in resolving the issue. It seems fairly reasonable to say that when the disparity problem was thought to be confined mainly to Jewish pupils in Israel’s state and state-religious schools, and when political power was in the hands of the left-leaning and centrist political parties, willingness to invest budgetary, political and conceptual effort in affirmative action was much greater than when the problem turned out to be concentrated mainly in the Arab and haredi sectors. Over the past fifty years, a large body of knowledge has been amassed in Israel and around the world regarding the ways and means of advancing children from socioeconomically weak backgrounds, and of reducing learning and educational gaps. Today it is clear that adequately-prioritized budgets, an insistence on teacher quality, and class size limits are means that have proven effective in advancing disadvantaged populations. I will briefly touch on each of these methods below. Budget – Based on the professional knowledge and research findings on the relationship between educational investment and educational outcomes that have been amassed, we can say with reasonable certainty that differential resource allocation which recognizes that pupils from weak socioeconomic backgrounds have more trouble with educational and learning performance than do pupils from more affluent backgrounds, is a necessary – though not the only – condition for reducing learning and educational gaps. Most developed countries, and Israel is no exception, have affirmative action programs in place; but ultimately, in spite of these programs, pupils from the wealthier strata generally have more – many more – resources available to them than do pupils from the poorer strata, meaning that affirmative action programs, in their present format and scope, are incapable of reducing resource disparities between different groups, much less neutralize gaps in educational and learning output. Teacher quality – Researchers unanimously affirm that the most important school resource, the one that has the greatest impact on learning /educational performance, is teachers. Hence the centrality of teacher quality to any discussion of the education system in general, or of pupil achievements in particular. Here three questions present themselves: Are schools serving disadvantaged populations more or less likely to have a teacher shortage? The answer to this question is usually yes. Do schools serving disadvantaged pupils tend to experience more teacher turnover? Here as well the answer is yes. Are teachers who teach pupils from the lower socioeconomic strata of “lower” quality? The answer here is less unequivocal, since it is hard for us today to clearly define what constitutes a “quality” teacher. There are indications that in Israel, unlike many other developed countries, the answers to all three of these questions are much less unequivocal. Class size – Another variable that is extensively discussed in the context of learning achievement is that of class size. Opinions regarding this variable’s impact diverge widely. Class size has weighty implications on both the financial and educational planes. The financial consequences have to do with the need for more buildings and teachers (the two largest components of educational expenditure), while the educational importance stems from concerns that reducing the number of pupils per class, which would entail a large increase in the number of teachers, could lead to a decline in teacher quality. The disagreements notwithstanding, two findings are widely accepted. One is that class size definitely affects pupils’ learning and educational achievements, especially in the lower grades, and that this impact is continuous. The second is that the impact is especially great for pupils from weak socioeconomic backgrounds. On the face of it, the Education Ministry had – and still has now – all of the tools required to optimally implement affirmative action. The Ministry is the main entity involved in budgeting Israel’s education system. The Education Ministry budgets most education-system activity, meaning that – if it really wanted to – it could institute a meaningful affirmative action policy at all levels of the system. Not only does the Education Ministry control most of the country’s education budgets; it also decides on the budgeting methods employed for each education framework under its supervision. Thus, it is the entity that determines whether budgeting should take socioeconomic background into account, or whether it should be progressive, or whether it should consider other factors that would make it regressive. The Education Ministry also controls teacher training and plays a decisive role in determining all aspects of teachers’ work conditions, wages, and career advancement paths; thus it also has a decisive influence on teacher quality, and the ability – should it so wish – to channel teachers to schools in accordance with need. By means of its curricula and matriculation exams, the Education Ministry also controls what is taught and is responsible for adapting subject material to the needs and abilities of different populations within the school system. Thus, it is in a position to decide on the opening and/or closing of future advancement tracks for Israel’s weaker populations. The Ministry is also the entity that decides what the maximum class size will be, and on the conditions for regulating the number of pupils in the schools; thus, it effectively determines what the average number of pupils per class will be. The Ministry of Education also has available to it an important tool for identifying and locating those pupil populations that need affirmative action – the nurture index. This index, which is based on a variety of background data, is used to predict pupils’ ability to carry out the tasks assigned to them at school. The lower this ability, the greater the amount of nurturing a pupil will need. It is important to distinguish between the budgeting system and the nurture index. The index is a tool for measuring pupils’ relative difficulty, due to background conditions, in reaching learning and educational achievements. The budgeting system is the formula and/or formulas that are employed when the budget is being distributed. The system (the formula) can make use of the nurture index or disregard it, and it can be progressive when the nurture index is regressive, or regressive when the nurture index is progressive. Since the 1960s, the nurture index has been altered five times; the changes have reflected: A. recognition of the need to include Arab and haredi pupils in the index; B. knowledge amassed regarding the impact of various factors on pupils’ ability to perform the tasks assigned to them; and C. the political limitations faced by the education system. The desire and ability of education ministers and, by extension, the Education Ministry’s senior professional cadre, have changed over the years, and it is better to look at their actions than at their rhetoric, which has always proclaimed the importance of reducing learning/educational gaps and assured support for affirmative action methods. Rabbi Shai Piron, the Minister of Education few years ago , in his recently-published book, discussed the difficulties he faced when he tried to return the system to the per-pupil differential standard method. How has Israeli affirmative action policy actually developed? The willingness and desire of the past decade’s educational leadership, from the ministerial level downward, to implement a courageous affirmative action policy can be seen from the examples that I will discuss below. We will be talking only about pre-primary, primary and lower secondary education, as the Ministry of Education does not, in fact, espouse any kind of affirmative action policy at the secondary education level. In pre-primary education, until recently, there was almost no affirmative action policy. To the degree that some kind of preferential treatment was shown to children from the lower socioeconomic strata, it manifested in subsidized tuition for children from lower income families and, later on, in full tuition exemptions in disadvantaged localities. In 2012, following a massive social protests of 2011 and the Trajtenberg Committee recommendations, it was decided to finally conclude the implementation of the Compulsory and Free Education Law, for 3-4 years old. This law was passed in the Knesset in the mid-1980s, but was not fully implemented due to lack of resources.. This was, in effect, a regressive measure, as children from weaker socioeconomic backgrounds were already exempt from tuition. The recent measure of assigning additional teacher’s aides to preschools, which applies to all of Israel’s overcrowded kindergartens, gives no advantage to preschools serving weaker populations as well. This is one example of a “two steps forward, one step back” kind of policy. Primary and lower secondary education are the two stages of schooling in which Israel’s Education Ministry has, since the 1960s, actively pursued affirmative action policy – mainly by allocating more teaching resources to schools that serve pupils from weaker socioeconomic backgrounds. Implementation of this policy peaked in 1994 with the adoption weighted student formula budgeting for lower secondary schools, and in 2004 for primary schools. In this method, the entire school budget was determined in accordance with its pupils’ socioeconomic background data, with identical rules for all pupils. In both cases, due to opposition from various circles both inside and outside the Ministry, this budgetary method was terminated (after one year in lower secondary schools, and after four years in the primary schools). In its place a system was instituted that, by the end of 2014, had nearly entirely put an end to affirmative action. In late 2014 Education Minister Shai Piron announced a return to the weighted student formula budgeting . According to him, the new budgetary method would give a 30% advantage to pupils from Israel’s lower socioeconomic strata. However, the system is much less effective at delivering affirmative action than was the earlier per-pupil differential standard system. Ultimately, the heroic effort made by Minister Piron will have inconsequential results – this despite the fact that differential budgeting was one of the main policy recommendations that Piron had advocated as director-general of the Hakol Chinuch (“Education is Everything”) movement. Moreover, the decision to implement the “new” budgetary method only in primary and lower secondary schools missed completely the historic opportunity to expand the use of differential budgeting to preschools and secondary schools as well and to include the rest of the educational expenses. This is a second example of the Israeli Education Ministry’s tango policy. What happened? Why did the Ministry refrain from instituting a bolder policy with a chance of achieving better results? The answer to the above question was given by Minister Piron in a lecture that he delivered on April 29, 2015, at a conference held at Tel Aviv University. He explained that, in real-life politics, one cannot behave in the manner demanded by “academic purists,” as he referred to this author, and that on this issue he had been forced to reach a compromise with his party chair, then-Finance Minister Yair Lapid. He repeated this explanation in his aforementioned book (Hakol Chinuch [Education is Everything], p. 60, Yedioth Ahronoth, 2015). Noa Heimann, the Education Ministry liaison in the Finance Ministry’s Budget Department, made similar remarks at a study day held by the Initiative for Applied Education Research on December 29, 2015, in Jerusalem. The main consideration that guided the new budgetary model was the ability to reach the ‘finish line’ – to successfully create a model that would be practicable both politically and publicly. The reform instituted by the Shoshani Commission was excellent in terms of its progressive principles, but ultimately it remained unrealized. Scholars and planners tend to build precise theoretical models, but ignore realities and constraints that keep models from being implemented at all – and certainly from being implemented fully. This is especially true of the political situation in Israel, where education ministers change frequently and one can’t be sure that the next minister will support a given policy. In our model, by contrast, we knowingly sacrificed what was correct ‘on paper,’ in favor of what could actually be implemented. Affirmative action could also be effected by channeling teachers with certain attributes to schools serving pupils from socioeconomically weak backgrounds. The Ministry offers an array of incentives to outstanding teachers in subject areas where there is a teacher shortage, in localities belonging to the lower socioeconomic clusters. But these incentives apply to only a very small subset of Israeli teachers (13,000 out of 200,000). The incentives’ total value is NIS 220 million (out of an entire teacher-salary allocation of NIS 35 billion). Furthermore, teachers working in schools that serve the lower socioeconomic strata in many larger localities that are not considered part of Israel’s periphery – are not compensated more generously, and their working conditions are identical to, though in practical terms much worse than, the conditions enjoyed by teachers in schools that serve more advantaged students. Is a consistent and resolute policy of reducing gaps an unrealistic proposition? Is there even any chance that such a policy would succeed? There is a rather widely-held opinion that no education ministry or education system anywhere in Israel or the world has the power to resolve learning gaps caused by the overall social structure generated by a given society. On the whole, I agree with this assessment. However, in Israel I’m aware of at least two instances demonstrating that one should never give up hope, and that the education system still has a major role to play in reducing learning gaps (even if the chance that that would lead, in turn, to a reduction of economic and social gaps is not particularly great). What I’m referring to are achievements that have been attained in the advancement of two fairly large Israeli population groups: the Druze and the Ethiopians. Let’s start with the Druze. The Education Ministry has made a substantial investment in the Druze schools. For years now, all Druze pupils have been receiving an extended school day, and all secondary schools participate in a comprehensive educational program operated by the Rashi Foundation. This massive investment, along with the appointment of a talented person in the Education Ministry, set in motion the processes required to lead this population to impressive matriculation-exam achievements; one Druze school even tops the achievement chart. 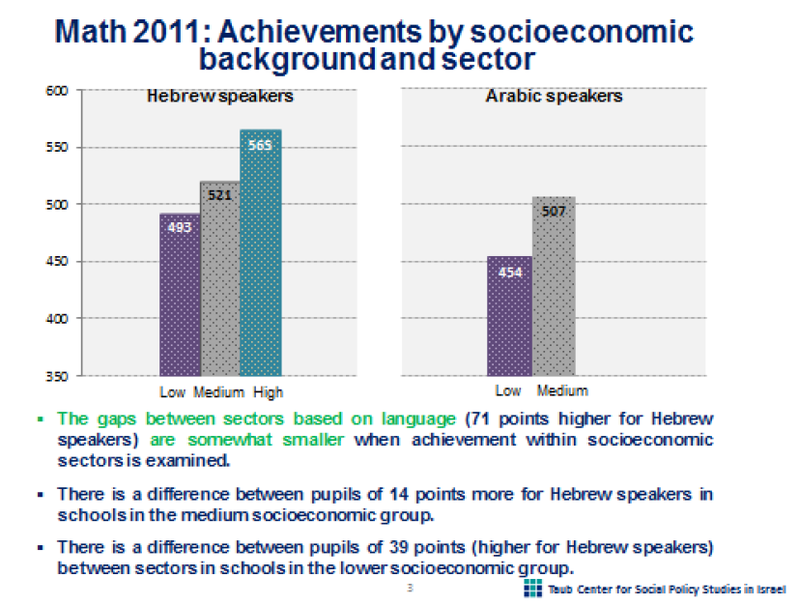 Like the Druze, Israel’s Ethiopian-Jewish pupil population has been the object of very large-scale affirmative action. The results have not been long in coming: the average achievements of Ethiopian pupils today improved dramatically. I propose that we now switch from the tango to a different kind of dance: the rondo, in which the leader knows where he’s going and the followers proceed along the path marked out – willingly and with eyes wide open.